BLACKBURN PAST: Magistrates / Sessions Courts / Police Station - Northgate c1912? Magistrates / Sessions Courts / Police Station - Northgate c1912? 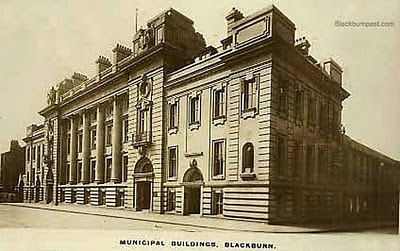 An old sepia coloured postcard of the magistrates courts, police station etc (Municipal Buildings) on Northgate. I'm assuming this section was built before the King Georges Hall side, as the buildings to the extreme left of the photo look like the older properties (pubs mainly, I think) that were demolished in the second decade of the 20th century. Duke Street is the street running down on the right of the photo. This building has statues at roof level too John! I'm going to have to start looking at these old buildings properly Colin, because it's becoming obvious to me that I'm missing out on quite a lot of Architecture which still exists around Blackburn.